Travel Channel Renews Eight; Sets Premieres For Four! Travel Channel has renewed eight series for 2015: BBQ Crawl, Big Time RV, Bikinis & Boardwalks, Ghost Adventures, Hotel Impossible, Mysteries at the Monument, Trip Flip (pictured) and Xtreme Waterparks. The network has also announced April premieres for four series: Bizarre Foods, Man Finds Food, Mysteries at the Museum and The Dead Files. Follow the jump for details. The network is also announcing dates for series with great storytelling by smart and entertaining talent premiering in April: “Bizarre Foods” premieres its eighth season on Monday, April 13 at 9:00 p.m. ET/PT, all-new original series “Man Finds Food” premieres Wednesday, April 1 at 9:00 p.m. ET/PT, the eighth season of “Mysteries at the Museum” premieres on Friday, April 3 at 9:00 p.m. ET/PT and the seventh season of “The Dead Files” premieres on Saturday, April 25 at 10:00 p.m. ET/PT. In Season Eight of “Bizarre Foods” with Andrew Zimmern, the three-time James Beard Award–winning TV personality, chef, food writer and culinary explorer is back with another round of exotic eats from around the globe. Zimmern believes that the best way to explore other cultures is by sharing food, even though what’s common fare in one country may be a challenge for the Western palate. “Bizarre Foods” is produced by Tremendous! Entertainment. In “Man Finds Food,” host Adam Richman is on the ultimate hunt to uncover the most unique, surprising, delicious and hidden, off-the-menu food treasures across America. He searches for the dishes you would never find, and in places you would never expect. “Man Finds Food” is produced by Sharp Entertainment. In Season Eight of the highly popular “Mysteries at the Museum,” history explorer and museum enthusiast Don Wildman continues to showcase his exploration across the United States and, for the first time, to other parts of the world. Throughout the new season, he continues to take a deeper dive into local archives, storefront collections and stately institutions, revealing more stories behind the objects and artifacts that reveal hidden secrets. “Mysteries at the Museum” is produced by Optomen Productions, Inc. In Season Seven of “The Dead Files,” former NYPD Homicide Detective Steve DiSchiavi and medium Amy Allan head back on the road to help beleaguered homeowners as they uncover paranormal histories and mysteries buried within all-new haunted locations. As they arrive on scene, DiSchiavi and Allan investigate each case independently of one another to preserve the integrity of their individual findings. They avoid all contact with each other until the very end, when they reveal their shocking discoveries to the homeowner in each episode’s intense conclusion. “The Dead Files” is produced by Painless Entertainment, Inc. In Season Three of “BBQ Crawl,” viewers continue to follow Canada’s BBQ Champion Danielle Dimovski as she travels the BBQ competition circuit to experience the best BBQ and win a few titles along the way. “BBQ Crawl” will return to the network with 13 all-new, half-hour episodes and is produced by Beyond Distribution. “Big Time RV” is back with a new season giving viewers an all-access pass inside America’s largest, and most prestigious, RV dealership located in Tampa, Fla., and Tucson, Ariz. While touring and testing every make and model of RV available, the expert sales force and first-rate customization center work together to satisfy the demands of RV lovers looking to buy or rent the biggest, most over-the-top RVs in the business. “Big Time RV” will return to the network with 13 all-new, half-hour episodes and is produced by Half Yard Productions. From the sinfully delicious foods, to the adrenaline pumping thrill rides, to the unexpected nearby attractions and miles of gorgeous beach – “Bikinis & Boardwalks” returns with Season Three. Once again, viewers get an all-access pass to summer’s most sizzling destinations, including an inside scoop on what makes these playgrounds the ultimate summer hotspots. “Bikinis & Boardwalks” will return to the network with six all-new, half-hour episodes and is produced by Indigo Films. Zak Bagans and Aaron Goodwin return with all-new episodes in Season 11 of “Ghost Adventures.” In each episode, Bagans, Goodwin and the team travel to a different haunted destination where they meet with locals, eyewitnesses and experts in an attempt to piece together the haunted history of each site. They then begin a dusk-to-dawn “lockdown” investigation, using the latest scientific gadgets and technology in an effort to obtain physical evidence of the paranormal and uncover the truth behind each haunted mystery. “Ghost Adventures” will return to the network with 13 all-new, one-hour episodes and is produced by My Tupelo Entertainment. Hotel expert Anthony Melchiorri is back with an all-new season of the popular series “Hotel Impossible.” The hotel fixer is relentless when it comes to getting struggling and under-performing hotels all over the world back on their feet and on the path to success. In Season Six, viewers will see more special experts, new designers, hidden cameras, gadgets and technology that test, evaluate and measure different aspects of each hotel. “Hotel Impossible” will return to the network with 13 all-new, one-hour episodes and is produced by Atlas Media Corp. In Season Three of “Mysteries at the Monument,” host Don Wildman returns to uncover some of America’s most intriguing events and greatest triumphs that are linked to many of the history-rich monuments across the United States. These include iconic buildings, bridges, memorials, national parks, statues, sculptures and gravestones. 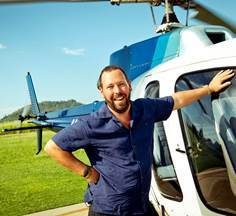 “Mysteries at the Monument” will return to the network with 13 all-new, one-hour episodes and is produced by Optomen Productions, Inc.
“Trip Flip” returns with Season Four featuring professional fun-seeker and host Bert Kreischer. Once he’s found two random people to spontaneously agree to a surprise adventure, Kreischer then delivers an action-packed itinerary filled with the kind of hair-raising thrills, one-of-a-kind accommodations, mouthwatering food and unexpected twists that only Travel Channel can deliver. “Trip Flip” will return to the network with 13 all-new, half-hour episodes and is produced by High Noon. Back with Season Four, “Xtreme Waterparks” continues to give viewers an exclusive, adrenaline-filled spin on the wildest, over-the-top and exhilarating water rides in the world! From high-speed, gravity-defying water rides to the world’s tallest water slides – this series reveals the most insane, nail-biting waterparks around the globe. “Xtreme Waterparks” will return to the network with four all-new, half-hour episodes and three one-hour specials. The series is produced by High Noon Entertainment. TRAVEL CHANNEL (http://www.TravelChannel.com) is a multiplatform travel lifestyle brand with the core mission of providing inspiring and compelling programming that takes viewers beyond their everyday destinations, making the unfamiliar familiar, whether it’s around the world or around the block. A dual feed network that is also available in HD, Travel Channel is the world’s leading travel media brand, and is available in over 94 million U.S. cable homes. Owned and operated by Scripps Networks Interactive (NYSE: SNI), Travel Channel has offices in Chevy Chase, Md., and New York, N.Y. Scripps Networks Interactive (NYSE: SNI) also owns and operates HGTV, DIY Network, Food Network, Cooking Channel and Great American Country. Previous PostPivot Premieres Oscar®-Winning Documentary The Cove!Next PostBET Conducts The Xperiment!